I have to admit to knowing nothing about these cymbals before they were given to me to check out, the only brief I got on them was that they were ‘expensive’. However, as soon as I tried them, it was clear what these cymbals are about and why they are expensive. The Elite line is limited to 14 & 16” hihats and 20 & 22” models. They are intended to be deep, dark, dry and dirty sounding and are quite clearly labour-intensive to make. I would say full of character too. Character is a good word; lots of visual character and lots of sonic character, albeit in the right hands. These cymbals are very much instruments and specifically crafted for your above average kind of player. Or, at least, to get the most out of them you’ll probably need a decent level of hand facility anyway. It wasn’t for any particular reason, but I spent more time playing the 16” hihats than the smaller model. They’re what you would want a 16” set of hihats to be – present but not overbearing, low pitched but not muddy and they had a nice definition. I liked them a lot. The 14” version is much the same as far as feel and how they play is concerned, just higher in pitch, but not so much that they didn’t blend in. The larger cymbals aren’t designated as ‘rides’ as such, so on that basis using the more contemporary terminology you might think they must be ‘multi’ (functional) cymbals of some kind – cymbals that aren’t specifically rides or crashes but can do both. Or maybe that’s just my interpretation, because these really aren’t multi functional, they’re very much rides. 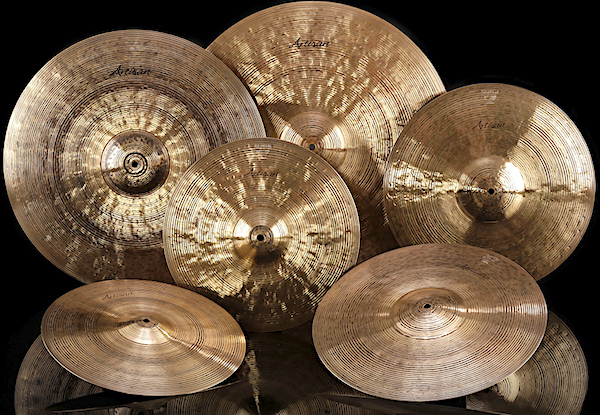 What these cymbals are, are heavily crafted (hence the cost) sonically multi-layered models, which to some degree needs the sound coaxing out of them. The 20” was for me potentially a bit more versatile than the 22 because it opened up more. The articulation and stick definition were the same but the wash and crash were greater which gave a little more body to my ear; basically it has more facility to crash on or play on nearer the edge than the bigger model, although even then it’s not really a crashing cymbal. This won’t give you that Alex Van Halen wash or anything near it. To play it, I would describe it as similar in feel to a flat ride but with the added benefits of a bell. I realise that seems contradictory, but if you know how a flat ride feels to play and responds under a stick then you hopefully get the idea. Basically, a flat ride will only open up to a point and then won’t go any further no matter how hard it is stuck. This is what this cymbal does and why the ‘crashing’ in the video yields such a flat response. Whereas most cymbals have a big and wide sonic palette with a steady tapering off, this has a fairly narrow one with a distinct and short taper, but I think that’s kind of the point. I’ll add that there was nothing pleasant in hitting this cymbal hard and I actually would have preferred not to other than for the demonstration purposes. It just didn’t feel right striking it with any force. For me, these two larger Elites are about as ‘proper’ a cymbal as you’re going to get, both in terms of how much goes into making them and how you need to play them. The sound they produce is almost like they have been buried in the earth and taped up beforehand; that dirty dark aged sound and feel. To play, they come across as feeling like old cymbals that have been well played. Visually, all of these cymbals are very cool and will only get better with age. Sonically, these are complex instruments, the 22” particularly, and as I said are not for the heavy-handed. I enjoyed the hihats and could see myself owning some as they have so much to like about them. The other two, they’re that high end that you really need your touch and feel together to bring out what they have to offer and I’m way off that point myself, at least for now. They’re certainly two of the most interesting and complex cymbals I’ve played to date though, that’s for sure. By virtue of what they are, these cymbals obviously aren’t for everyone, but for those they are aimed at I’m sure they will be very welcome and cherished.